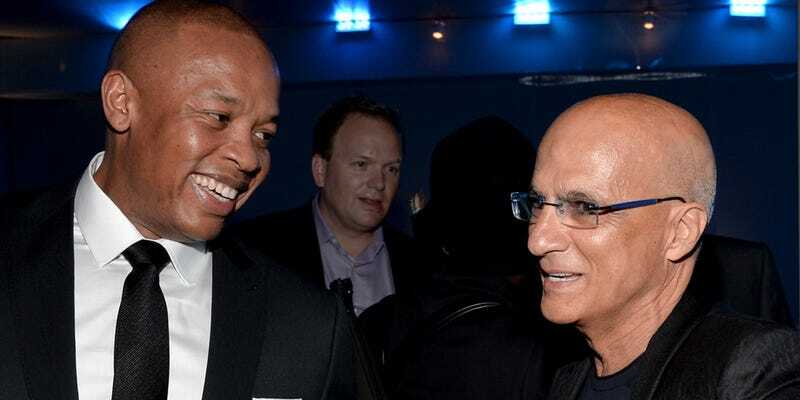 Are Dr. Dre and Jimmy Iovine Really "Saving" an Industry? What is Jimmy Iovine and Dr. Dre? In its first six weeks, Apple Music attracted 11 million users for its free trial. It’s on its way to what will no doubt be a huge user base of customers who will pay $10 per month to stay connected to the service. Dr. Dre’s long-anticipated record Compton, his first since 2001, was streamed 25 million times on Apple Music in the first week, and also sold a “half-million downloads” through iTunes. The Dre-produced biopic about his old group NWA, Straight Outta Compton, was the number one movie at the box office last weekend, with $56 million in ticket sales. Daaaaaaamn. Beats by Dre controls 34 percent of the exploding US headphone market. That last number comes from Jason Tanz’s profile of Iovine in Wired. It’s a glowing account of Iovine and Dre’s recent accomplishments, which casts Iovine, the 62-year-old mogul, as the music industry’s savvy digital prophet. He’s the only old-school insider who saw the collapse of the industry coming, and he’s the only guy with the contacts and foresight necessary to help pull it out of the hole. Why, Jimmy? We’re told he doesn’t do it for the love of music, or even for the money, per se. Iovine wants to be influential. Tanz describes Iovine’s knack for tidy one-liners with the one he thinks neatly sums up the exec’s four-decade career. But the line I’m talking about is the one he uses to describe his life’s ambition: “All I’ve ever wanted to do is move the needle on popular culture.” It sounds almost modest, the way he says it. Don’t be fooled. Some music executives want to help talented artists reach their natural audience, no matter how small. Iovine is not among them. He’s after the kind of massive flash points that unite populations around the world and change not just what they listen to but how they dress and move and behave and think and live. Iovine wants to manufacture The Culture. That’s why he worked with Steve Jobs to negotiate the deals that made it possible to sell 99-cent songs through iTunes. That’s why he teamed up with Dre to launch Beats Electronics and Beats Music. And ultimately, that’s why he and Dre sold the whole thing to Apple. We’re meant to understand that this was Iovine’s goal all along. Apple is the most influential cultural force in the world, and so that’s who Iovine wanted to work for. If Jimmy and Dre wanted to conquer everything, you could argue they did it twenty years ago. Their accomplishments today across music, film, and yes, tech, are even more impressive. They are undeniably significant. Jimmy and Dre, congrats, you moved the needle. You are a cultural megafactory. But the question the Wired story asks isn’t “can they move the needle,” it’s “can they save the music industry.” How you answer depends how you interpret the question. Can they save the music industry as it existed before? Definitely not, it’s beyond saving. Can they make it at least somewhat profitable? In part at least, Apple Music will become one of the tentpoles of whatever the music industry looks like in the future, just as iTunes was a huge segment of the music industry for about a decade. It’ll coexist with competitors, and they’ll duke it out until some kind of equilibrium is reached. There will be a future for the digital music industry. But can they “save” music in the loftiest sense? According to Wired, the key might be Iovine and Dre’s efforts to cultivate a new crop of music-tech people. They’ve invested in the Jimmy Iovine and Andre Young Academy at USC to educate just this kind of musical entrepreneurship. Iovine hopes this school will inspire dozens more like it, and the future music startups of the world will be filled with brilliant musical business geniuses. These young golden children will usher in a new era of lucrative music economics. It’s a beautiful story that sounds a little too optimistic.